Lots of exciting news coming from our Bethany Beach and Rehoboth Beach offices here is sunny Delaware! 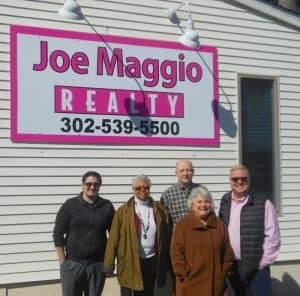 You may be aware that Joe Maggio (Owner/Broker, Joe Maggio Realty) and Mike Moreland (Realtor, Joe Maggio Realty) recently acquired Connor Jacobsen Realty, the oldest real estate agency in Bethany Beach. This thrilling development has the entire team at Joe Maggio Realty’s Delaware Vacation Rentals buzzing with excitement as we welcome all our new landlords, as well as our current and new clients to enjoy the unique Delaware Rentals Experience! For many years Connor Jacbosen was a leading Delaware Beach vacation rental company offering oceanfront and oceanside vacation rental properties in Bethany Beach, Ocean View, Middlesex Beach, Fenwick Island and the surrounding areas, and with this extensive portfolio of beautiful beach houses, condos and cottages now added to our rental property portfolio, Delaware Vacation Rentals offers our website visitors the opportunity to search for their ideal vacation rental property online, taking all aspects of your requirements into account, whether it’s budget, location, or a pet-friendly rental you are looking for. You’ll find it easy to select and book your vacation online, and we are just a phone call or email away if you have further questions either prior to or following booking. With single family homes for the entire family to enjoy an extended summer vacation, or 1 & 2 bedroom condo’s for friends to kick-back and enjoy the Delaware sunshine, you’ll find what you are looking for within just a few ‘clicks’. And with over 45 experienced real estate agents at Joe Maggio Realty and Delaware Vacation Rentals, we provide a personalized service that’s professional, courteous and responsive. Feel free to call our rental agents at our Rehoboth Beach office on 302-226-3770, or our Bethany Beach office on 302-539-5500 and one of our team will be happy to help with your summer rental property search today!